Aaron Scott is a first call musician in the Columbus area. Although he plays the drums, his first love was piano. Son of acclaimed pianist, Bob Allen, Aaron got his start in music at age five. He continued playing classical piano into college, but it was playing percussion that has been his passion. Playing shows and in bands throughout high school, Aaron went on to study music at North Texas State on scholarship and later graduated from Capital University Conservatory of Music. In addition to performing, Aaron has been teaching percussion for over 30 years. He has taught at Columbus Pro Percussion, Capital University CommunityMusic,MusicRoyale, Dublin Schools and Newark Schools doing group and individual lessons. You can currently find Aaron at the new Vaughan Music Studios facility in Upper Arlington. Aaron’s varied background and knowledge of many musical styles affords him the ability to move seamlessly from teaching rock/pop/latin/ jazz drumset, marching and symphonic band percussion as well as all O.M.E.A solo and ensemble percussion. Aaron has been a successful player as well as contractor for clubs, restaurants and private companies that have entertainment needs. Aaron contracted music at the original Hyde Park Grille in Arlington from it’s opening in 1989 until 2003. He has contracted for Nationwide,Red,White&Boom, Huntington Banks, BancOne, and Mettler Toledo. He currently books entertainment for the new Barrel 44 in Bexley. Aaron has played with Bobby Floyd, Mark Flugge, Vince Andrews, Kim Pensyl and Dave Powers to name a few. 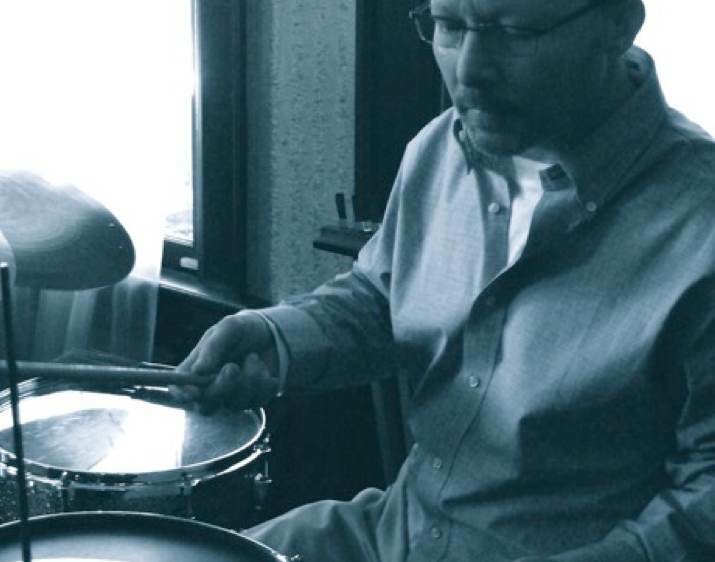 He can currently be heard with his jazz trio featuring Dave DeWitt and Derek Dicenzo Wednesdays at Barrel 44 Bexley. He can also be heard regularly playing in the popular blues and R&B band THE SOUL. New recordings from both these groups are expected out later this year. Aaron can also be heard on the new Donatos Pizza national television advertisement.